Visiting the capital of Scotland is a great choice for one of our spa deals in Scotland. Edinburgh is a bustling and beautiful city with plenty to do when you are not relaxing around the pool or having a spa treatment. Our spa breaks in and around Edinburgh are available at the Edinburgh Carlton Hotel and also the Q Hotel Westerwood. With a two night spa break you'll be able to make the most of what Edinburgh has to offer. Do some sightseeing and indulge in some history at Edinburgh Castle, Scotland's most famous castle and oldest building in the capital. 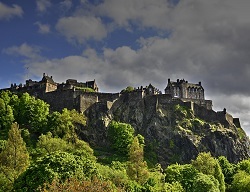 Take in the cobbled streets of the city and the historic monuments in Princes Street and on Calton Hill. Not for the faint hearted the Edinburgh dungeon's will bring Scotland's murky history back to life. There are many museums and galleries with The National Gallery being a top free attraction. Spend an hour in this peaceful setting where you’ll find masterpieces from Raphael, Velázquez and Vermeer to Monet, Cézanne and Van Gogh. And of course there is and abundance of shops, cafes and restaurants if you find yourself with some more time on your hands whilst enjoying one of our relaxing weekend spa breaks in Scotland. You’ll find one night and two night spa breaks at the Q Hotel Westerwood and the Edinburgh Carlton. The Edinburgh Carlton Hotel is situated directly on Princes Street so you are in the heart of the city. Our overnight spa breaks generally consist of dinner, breakfast and one or two spa treatments per person. The earlier you book your perfect spa break package the better the price and availability so call us on 0800 246 5511 to check availability.